I know I have at least three new awards that I have neglected over the last week but I have not! I am still very excited and extremely blessed to receive these awards. 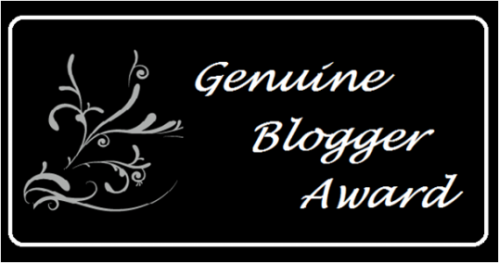 Again, I would like to thank my girl Sherline for nominating me for the Genuine Blogger Award. This young lady is an amazing woman who is filled with lots of wisdom and she was definitely a great help during the Daniel Fast! Thank you so much for the nom. There are no rules for this award. I will not go crazy nominating people because I have two more awards left LOL. Thank you again and thank you everyone for always tuning in and commenting and thank you for all of your encouragement during the fast! Xoxo! Here are my nominations and of course I would nominate Sherline again if I could! Thanks!! Well done , well deserved award to you!! OH! and thanks for nominating me! You are getting some cool awards! 🙂 Congratulations.